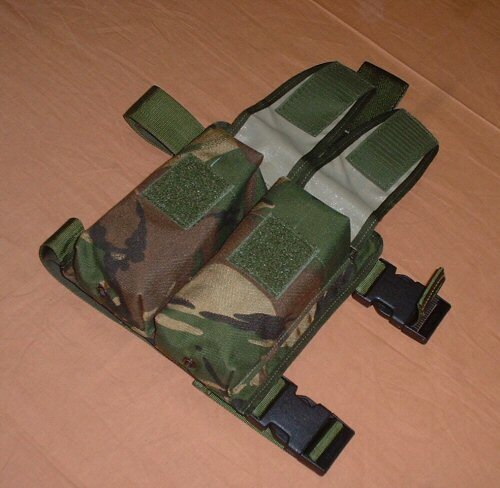 Low profile leg mounted double ammo pouch designed for latest operations in Iraq and Afghanistan. The pouch is made of milspec PU coated 1000D Cordura and is IRR treated. 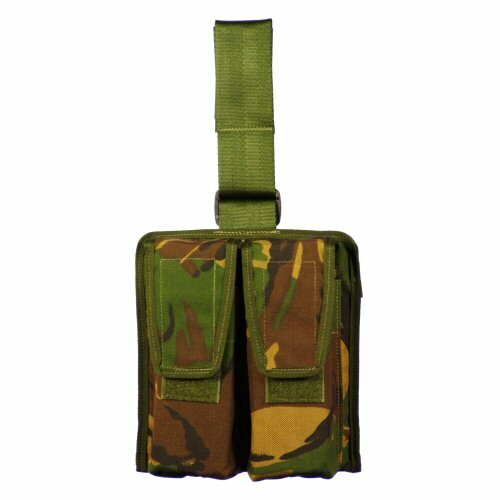 The pouch has two velcro pockets, each able to take two M16 or SA80 magazines in low profile on the leg. Each pocket has its own drainage hole. The back of the pouch is foam lined for comfort and weight distribution. The pouch is held onto the leg by means of two 40mm Cordura webbing straps reinforced with high-grade elastic to allow for stretch and comfort during movement. These straps are fitted with adjusting quick release buckles which are heat resistant. The leg extension strap is made of 50mm webbing which is fully adjustable with velcro and a plastic slider. The belt loop portion of the strap opens with velcro and is designed to form a loop to fit up to a 3 inch duty belt. 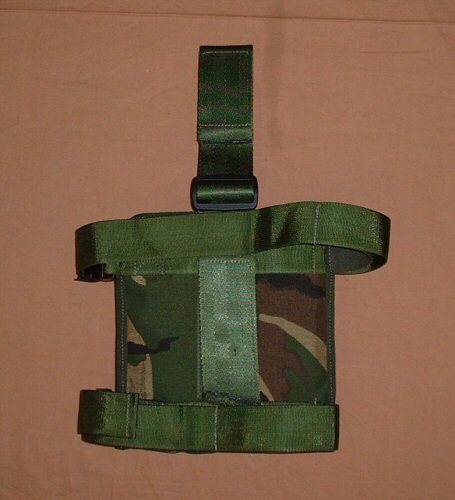 This is fully compatible for use with the Wyvern All Arms vest, Wyvern All Arms belt kit or any vest fitted with a 50mm wide rectangular D-ring. -Large carry capacity for various magzines. -Adjustable straps for adjusting to different leg and belt sizes. -Quick release clips on straps allow for quick removal or application of pouch. -Flaps close with velcro for speed and security. Angled view of pouch, with the flaps open.